Alfalfa's (Medicago sativa) deep root system pulls valuable minerals from the soil. With the aid of sun light, nutrients including beta carotene and chlorophyll are made available to the body in a usable form. 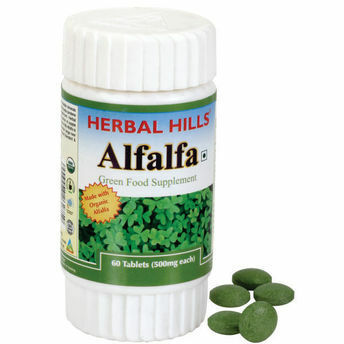 Alfalfa is an excellent nutrient rich in a wide range of minerals like Calcium, Magnesium along with Vitamins like Vitamin E & Vitamin C.
A high concentrate of Alkaloids makes Alfalfa useful in improving blood circulation & maintaining healthy Cholesterol levels.